What was believed to be the first planet discovered to be comprised largely of diamond most likely does not have a high content of the precious mineral after all, according to new research scheduled for publication in in the Astrophysical Journal. The planet, which is located approximately 40 light years from our solar system, was first analyzed in 2010. At the time, it was concluded that the world had a surface of graphite surrounding a thick layer of diamond, instead of water and granite like on Earth. However, a new team of investigators, led by University of Arizona astronomy graduate student Johanna Teske, now believes otherwise. Teske’s team revisited the original observations, which – together with simulations used by astronomers to model the interior of a planet, based on data such as its radius, mass and orbital velocity – had yielded a carbon-to-oxygen ratio of greater than one. In other words, those scientists believed that the planet was carbon-based instead of oxygen-based as are Earth and most other planets in the Milky Way. 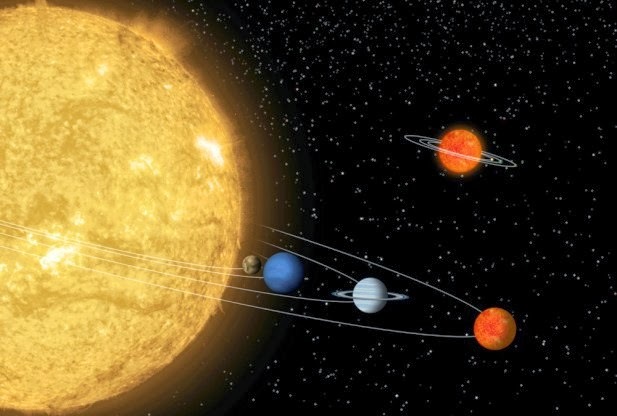 However, Teske and her colleagues now report that the planet’s host star contains nearly one-fourth more oxygen than carbon, placing it about midway between the Sun and the levels suggested by the previous study. Those finds cast doubt on the original study’s conclusion, making it unlikely that the planet in question is actually diamond-rich. 55 Cancri e is a super-Earth that is roughly twice the Earth’s diameter and eight times our planet’s mass, the researchers said. It is the smallest member of a five-planet solar system, located in the constellation Cancer. Furthermore, it is so close to its host star that it has a surface temperature topping 3,000 degrees Fahrenheit, and orbits at such a pace that one-year is only 18 hours long, they added. Teske and her associates instead opted to use alternative indicators of the oxygen abundance. By averaging all of those measurements together, she said that it provided a more complete picture of the amount of the element actually contained within the star. Furthermore, the researchers note that the “diamond planet” hypothesis was based on the presumption that a star’s composition has an impact on the composition of its planets. “However, as astronomers discover more and more extrasolar systems, a one-size-fits-all formula becomes less likely,” the university said. Teske explained that we are currently uncertain whether or not our solar system is common or unusual in terms of the larger universe, as many of the systems astronomers have discovered have giant gas planets located closer to the star (versus our solar system, where rocky planets are closest to the sun).